Pointing upward with a bit of masculine panache, our Debonair Mustache is a slick and stylish option for an aristocratic gentleman’s upper lip. Not at all the barbaric and bushy mustaches worn by the uncultivated masses. Measures approximately 1-inches tall by 4-inches wide. 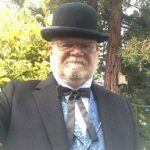 After much debate on what to wear for Comic Con this year (I vacillated between investing in a high-end Star Wars costume, the Bandersnatch from Alice in Wonderland, etc), I at last decided to go as a Victorian Doctor and purchased an ENTIRE outfit along with many accessories, all at the VERY last minute, from Historical Emporium. Everything I ordered was in stock (Woot!) and I upgraded the shipping to Next Day Air based on my indecisiveness and my waiting to order 3 days before Comic Con. I placed my order on Sunday night. My order arrived Tuesday! EVERYTHING I ordered was perfectly amazing and of high quality! I was (am!) blown away! AND, to top it all off, Historical Emporium refunded my Next Day Air Shipping ($63!) because I live in Southern California, which is within their 1 day ground shipping zone already. What? Who does that? Holy moly - what a great company, what outstanding service and what amazing products! I'd write more but Comic Con starts in 24 hours and I've got to get ready! The whole experience was as expected. The order, shipping, and product I received were all flawless. No complaints at all. I live on a ranch in Arizona so a good durable vest is a practical necessity. I glad to say that the all canvas work vest meets all my criteria. Keep up the good work Historical Emporium. Your customer service is bar-none. Thanks. Very nice vest.Extremely fast delivery. Very courteous personnel on the phone. I highly recommend this company for your historic clothing needs. I have been searching for a Norfolk jacket for many years and finally found one at Historical Emporium. Price was good too.